Rarely do we suggest starting with a sequel, but in the case of Bean Dreams, you can jump right in. Don’t worry if you’ve never heard of Bean’s Quest, the original title in this now two-part game series, because I’ll catch you up real quick: you play as a sombrero-wearing jumping bean in an adorable platformer world. Beyond that, there’s not much to get—and that’s part of the charm of this instant classic game. Bean Dreams is that exceptional game that is actually as responsive and fun on the iPhone as the classic 1980s console titles that inspired it. Here are three reasons why you need to add this game to your app collection. Beans, beans, the jumping fruit: Unlike other platformers you’ve played, the biggest difference is that your Bean Dreams character is always jumping. The controls determine which direction he bounces, and are as simple as hitting the left or right virtual buttons on your iPhone. With a constant stage of bouncing, you have to be very careful about where you land. Oops. But the bean’s constant state of motion provides interesting game-play challenges. For starters, unlocking all of the Dream Stars (the in-app currency that unlocks additional worlds) in a given stage requires you to be very precise with your jumps. For example, I completed an early stage in fifteen jumps—not bad, but that only netted me a single dream star. If I was more precise in where I jumped and had I timed my attacks on my enemies properly, I could have completed the stage in five jumps. It also means that things like spikes, enemies, and other obstacles cannot be simply waited out: Bean Dreams requires precise timing in your actions more so than you’ll find on any other platformer on iOS. G-rated aesthetic, R-rated difficulty: About that difficulty: some of the goals in a given stage can be solved in your first five or so passes through a stage. Others require you to shake the phone, call it names, toss it at your couch, and come back in four hours when you’ve calmed down and stopped muttering obscenities. At least, that’s my experience. “But it’s a cute game!,” you’re probably saying. And it is—deviously so. You play in a world not dissimilar from Kirby’s Dreamworld, complete with adorable enemy spiders, axolotls, and a bean with a freaking sombrero! It’s like several nefarious people in lab coats engineered the most adorable, minimalist game protagonist they could. And with a chiptunes soundtrack that is varied and fantastic, Bean Dreams is weapons-grade cute. 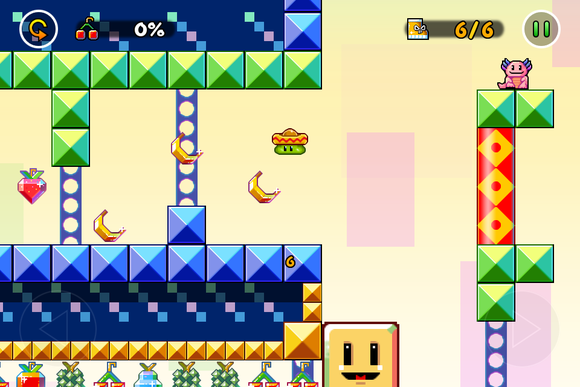 Collecting all of the fruit in a level will earn you a Dream Star. Collect them all and your dreams will come true! Ridiculous and replayable: Not only does the soundtrack change with the levels, but the worlds really do progress in difficulty and complication. 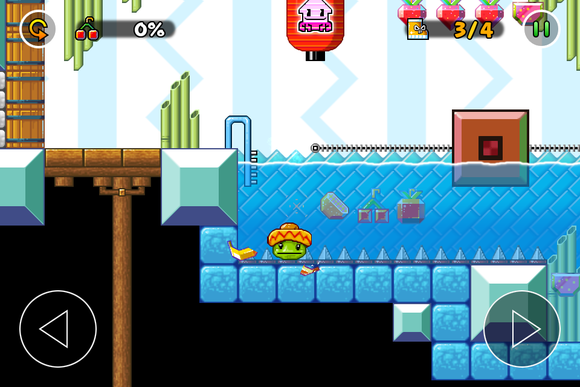 The Japanese bath house levels, for example, have not only a different color scheme and probably the best song of the game, but compared to previous levels, the bath house stages are much more about understanding the physics of your jumping powers in relation to water. For example, knowing how high you have to jump to then dive in the water and reach certain items is a major part of the problem-solving strategy to advance. This builds upon the previously established slide-and-jump mechanic introduced in the Fun Factory levels. Each world complicates this simple formula while also giving you new challenges. That way, the game-play doesn’t get old. Bean Dreams further ups its replayability factor by its Dream Star mechanic. 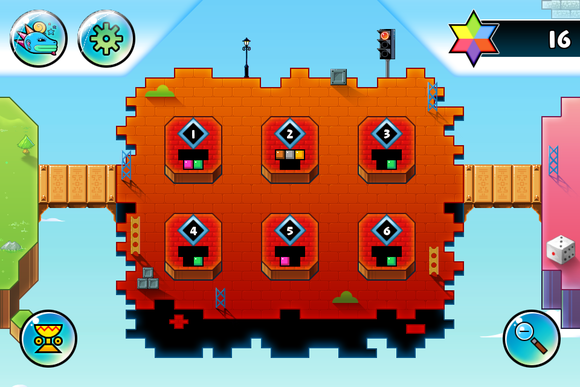 Similar to puzzlers, each stage has a set of goals that will unlock further levels. Unlike many puzzlers, though, some of these goals can’t be accomplished at the same time. On a given level, it’s often a choice of going and finding the collectible fruit or the hidden axolotl or minimizing the number of jumps you make to reach the goal. 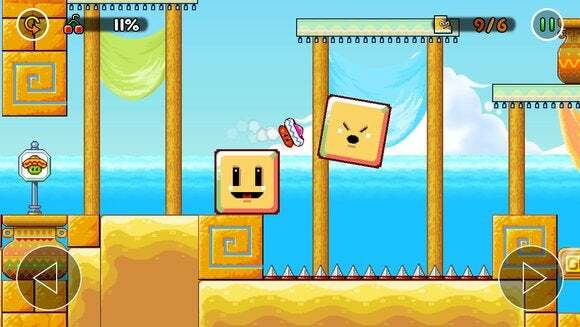 The fruit is often the easiest, just requiring you to explore and survive the level; the jumps require a great deal of pinpoint platforming, and the axolotl often requires a bit of puzzle solving. There are 48 stages stretched over several distinctive worlds. With 48 unlockable stages, a rare degree of flexibility in a player’s approach to a level, clever level design, and an exceptionally fun, bright aesthetic, Bean Dreams is a must download.